In a country as water poor as South Africa the use of Astroturf for sports fields and public areas has been steadily increasing as the legislation governing water usage has tightened and municipal rates for water consumption have increased. Today manufacturers of equipment designed to keep Astroturf in peak condition and appearance such as Horger Astroturf Equipment are extremely active in South Africa. These companies have made some of the most advanced Astroturf care products in the world available to the South African market. The Horger range of Astroturf cleaning equipment is designed to make the cleaning of artificial grass surfaces as trouble free as possible. The self propelled Horger Astroturf cleaning system ensures that the artificial grass remains as pristine as the day that it was first laid by removing dust, pollen and humus that can contribute to the growth of algae, moss and mould. The growth of these organisms can impact not only on the appearance of the Astroturf, but can also cause health problems amongst users of the artificial ground covering. Inadequate care of the Astroturf can also cause hardening and less water permeability, affecting the lifespan of the product. 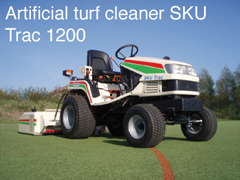 By using Astroturf cleaning equipment from Horger such as the Horger artificial turf cleaner SKU Trac 1200 users of artificial grass surfaces can ensure that the turf remains safe for use at all times. Neglecting the upkeep of the Astroturf can cause the surface to become extremely slippery, greatly increasing the risk of injury. 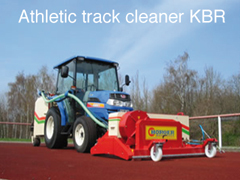 Horger Astroturf equipment can be used to vacuum up the filling material, such as sand or granules or even a mixture of both, filtering and cleaning the material and then setting the turf upright before returning the granular material to the turf. By using Horger equipment to ensure that the Astroturf remains in excellent condition users can make certain that the turf is both pleasant to look at, as well as safe to use. This entry was posted in Cleaning Equipment and tagged artificial turf, horger, horger astroturf equipment, turf cleaner by admin. Bookmark the permalink.